The Seafriends seminar programme reaches out to business and community leaders all over New Zealand. They will be held in the major towns at times convenient for all. New Zealand is entering a critical period for its terrestrial and marine environments. These seminars aim to make people aware of the special place New Zealand occupies in the world and how sensitive its environments are and how rapidly these are degrading. The seminars trace the effects our actions have on the environment and how to minimise these. The programme is backed by extensive scientific information on the Seafriends web site and must be seen as an introduction to the NZ ecology and its problems. The seminars give people the chance to meet the author, Dr Floor Anthoni and to ask burning questions. Leaders, movers and shakers will appreciate Dr Anthoni's direct and forthright style of delivery with many diagrams and examples. Ecological and mathematical principles that apply to business and society will become your new decision tools. You won't be sorry you did attend. Never before have these issues been presented to the public! The information and presentation are entirely new! Please not that even after spending thousands of dollars on advertising, letters and free invitations, the interest for these seminars amounted to 1.0 attendee per seminar, all of whom were friends. Clearly a nation, so disinterested in the future of its own children, deserves to learn the hard way. All seminars from 13:00-16:00, cost $90 per person (see below). About the author, Dr Floor Anthoni and why he devoted his life towards saving the sea. For a curriculum vitae with dates and portraits, visit this link. A summary of what the lectures are about. How to organise a private seminar for your group, with Dr Anthoni as speaker.
' For comments and suggestions, please e-mail the author. Read instructions for printing. Dutch born Dr Floor Anthoni immigrated to New Zealand in 1975. With a doctorate in computer science from the Technical University of Delft in Holland, he spent most of his time in New Zealand furthering his computer company and designing quality software. But around 1987 all that changed (a mid-life crisis perhaps?) when he saw how rapidly New Zealand's marine environment was degrading. In 1990 he decided to devote the remainder of his life fighting for the sea he loves. He and his wife Maria, spent their savings and earnings on realising the Seafriends Marine Conservation and Education Centre in Leigh. Dr Anthoni retrained himself as a marine ecologist, specialising on matters related to degradation. He is driven by a single question that nobody could answer: Why are we losing so much so fast, and why now, here in New Zealand? It is truly a perplexing question for a rather new country with so few inhabitants. But the coal miners' canaries of the sea [see box below], the species that are not affected by direct exploitation, had a strong message that became stronger still over the years. Today, our coastal seas are deteriorating at an alarming and explosive rate. Action cannot be postponed and everyone should become aware as also everyone has to play a role. In 1997 Dr Anthoni began the Seafriends web site to reach out and to have a medium, large enough to explain in detail the science behind the phenomena. This informative educational site is now about 3000 pages in print, with some 1000 diagrams and drawings, and over 5000 images. In 2005 the web site drew 1.5 million distinct visitors and transmitted 150 gigabytes of data. Growing at 30% per year, the message is gradually reaching more people. The seminar series is the latest attempt to get to the hearts and minds of the people who wish to pass on to future generations a world that is better rather than worse than the one they inherited themselves. This will amount to a gargantuan effort during which we cannot afford to make mistakes, because quite evidently, we do not have such resources. You may quite easily think that these seminars are but the scare mongering of a derailed scientist who is quite alone in what he writes and says. But in the 15 years of going it alone, Dr Anthoni made epoch making discoveries that now lead the fledgling science of degradation. Remember that the miners' canaries of the sea do not lie and do not have political agendas. What they are showing is as real as gravity (stones falling back to Earth), even though much knowledge was gained from observation (anecdotal evidence as scientists call it). Having had two legs firmly planted in the economic reality of business, Dr Anthoni does not associate with the green movements, but rather promotes a common sense approach to conservation, one that looks at the wider issues and that takes cost and effectiveness into account. Leaders of society will appreciate Dr Anthoni's direct and forthright delivery with many diagrams to jog the mind. The seminars are also backed by the extensive documentation on the Seafriends web site. Coal miners all over the world, who work hundreds of metres underground, are threatened by invisible and non-odorous gases like natural gas (CH4) and carbon monoxide (CO). Of these two the carbon monoxide is the most perilous as it binds to the red hemoglobin molecule in the blood, preventing blood cells from transporting oxygen (O2). A poisoned coalminer thus suffocates without any severe symptoms. It was discovered that a small yellow song bird, a canary, was much more sensitive to carbon monoxide poisoning than humans, so miners took these birds in small cages down the mine shafts with them. 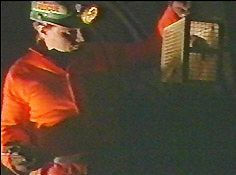 If a bird showed symptoms of distress, miners would save themselves by going into well ventilated tunnels. Often 2-3 birds were used to better interpret the symptoms. But around 1986 the birds were replaced by electronic sniffers with dials and alarms. The problem is quite simple: water falls on the land and drains back to the sea. From the land and where people live, the water carries substances with it. In small amounts these are beneficial, but when overstepping a maximum, they rapidly become harmful. As we are losing our precious soils, we are destroying our coastal seas and also losing our beaches. The solutions are quite simple: reduce the number of people, severely limit what they can do, and return our productive lands into native forests. Although these solutions are guaranteed to work, they are also unacceptable. So how can we save our land and sea with a growing population that will waste more as well? We obviously need to be very much smarter, but before a doctor can prescribe a cure, the patient must first be diagnosed. Knowledge is essential to decision making. Why is New Zealand such a special place? There exist compelling reasons why New Zealand is not like most of the world. Through millions of years of isolation it has evolved a flora and fauna that are unique. What is often overlooked, is that the soils that formed underneath our unique forests, are also unique. When burnt, they are unexpectedly fertile due to thick layers of humus and top soil, as also underneath even thicker layers of subsoil were formed, capable of holding moisture. Now, some 50-100 years later, the humus has disappeared and also most of the top soil, leaving the deep sub soils to erode ever faster. NZ soils have proved to be exceptionally sensitive. We must understand first how we have wasted our soils. What is happening to the sea? As soils are bleeding into the sea, the fertility for future generations is lost to the sea water in the form of nutrients as also a layer of sticky mud suffocates marine creatures. The consequences of this potent cocktail are unexpectedly damaging and for good reasons their threat increases rapidly beyond imagination. It explains why the past two decades have been unlike millions of years before. Degradation of our seas is rapidly wiping out our native marine fauna and flora which evolved in very clear waters. It is now threatening our coastal fisheries. We must understand how degradation proceeds and why our seas are equally sensitive as the land. Behind all knowledge one can find rules, and it is the task of science to find the rules describing the natural environment we live in. Many of these rules also apply to human behaviour, business and society. It is important to understand the principles behind resource management, because even your life can thought of as a resource. It is equally important to know why threats are accelerating and what their motives are. Dr Anthoni's epoch-making discovery of an important but overlooked ecological factor in the sea (the planktonic decomposers) and a new scientific method to measure it (the Dark Decay Assay) led to the discovery of a number of overlooked ecological laws that now explain how eutrophication and degradation work. Quite simply, the sea does not work the way scientists thought it would. The DDA method is so simple and cheap that it places a powerful plankton tool in the hands of the public, with which lakes, rivers and the sea can be monitored. These discoveries are so important that scientists cannot afford to sit on the fence. Come and listen why. New Zealand has entered a new era during which a new and rapidly accelerating threat renders traditional management like fishing quotas and marine reserves ineffective. If one would remain unaware of this, one could easily waste resources on doing the wrong things. There is simply no excuse for continuing to waste our precious lands, thereby killing the sea and losing our beaches as well. Only by saving the land can we save the sea! During 14 years of lecturing schools, Dr Anthoni has learnt how to convey the above to children aged 11-16, so you should not be worried that the seminars could be too difficult to understand. We hope you will rise to the challenge! The issues presented during these seminars are not only pressing but the understanding behind them is also entirely new, never before presented to the public. So it is understandable that the seminars fill up rather quickly. Therefore make sure that you book well in advance to avoid disappointment. The seminar audience has been limited to 30-40 per session, but we should be able to flow over into an evening session from 18:30-21:30 in order to accommodate unexpected enthusiasm. Seminars include afternoon tea and a complimentary Seafriends CD (worth $30) with all the necessary supporting information. Booking: ring 094226212 or e-mail. Please mention date and venue when booking. Where possible, you will receive confirmation of your booking. Paying: you can pay on arrival (arrive a little earlier for this) and pay by cash or cheque. We will also be able to accept credit cards by 'zipzap' machine but EftPos will not be available. If possible, help us avoid invoicing businesses and government departments. You will be given a receipt of payment. Remember! Your payment helps us achieve more sooner! The seminars organised by us have to cover the costs of advertising but when you organise a private seminar, you can save in two ways, on the one hand because we do not need to advertise, and on the other hand by making them larger for more attendees. This can reduce the cost per person considerably. Ring us to negotiate a cost for Dr Anthoni's time, accommodation and travelling and most suitable date.